I was born premature at 26 weeks with a distended stomach. I was referred immediately to Great Ormond Street Hospital (GOSH), London, in December 1987, where I was diagnosed with necrotizing enterocolitis (NEC) and a perforated bowel. My consultant was called Mr Kiely and I had three major operations to try and rejoin my perforated bowel. When I was allowed home in April 1988, my parents thought it was a miracle. I was one of the smallest babies ever to survive at the time. I was under GOSH care for around four months and had check-ups into my early childhood. Since then, as an adult, the NEC has resulted in my being diagnosed with irritable bowel syndrome (IBS). Nowadays, I can go for weeks with no symptoms at all, then out of the blue I’ll have a flare up that can last a week or more. It can have a severe impact on my work and social life, but I’m slowly gaining confidence and trying not to let it affect me, day-to-day. 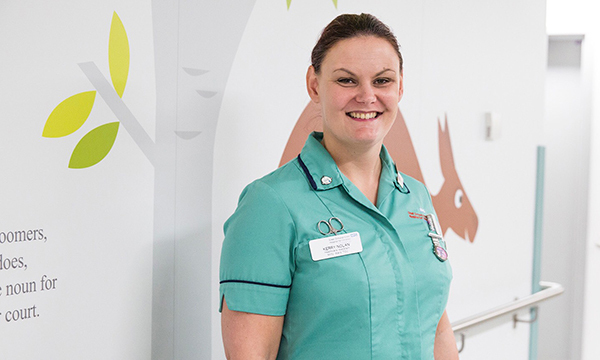 I decided that I wanted to be a nurse when I was six and I was inspired by the many photos of me as a baby in GOSH and by stories that my parents told me about my time there. I’m grateful for the care GOSH gave me and I wanted to give something back. So, when I was offered a place at London South Bank University, I accepted without hesitation. I wanted to go there because it offered training at GOSH. I got to work alongside Mr Kiely, the consultant who treated me, who is now retired and Mary Wallis, a volunteer who was a GOSH neonatal nurse adviser who also looked after me as a baby. I had a nice chat and a cup of tea with Mr Kiely. It was amazing to be able to shake his hand and say thank you for saving my life. I had to take a break from studying for personal reasons and unfortunately never completed my nursing diploma. I’ve made a promise to myself that I will one day. I am currently studying my final module with the Open University, so will graduate in May 2018 with a BA in health and social care. I plan to go on to do a post-graduate degree in child nursing to complete my dream. I currently work as a healthcare assistant at GOSH on a respiratory ward. I started here in May 2017 and absolutely love it. Respiratory medicine has been my passion since discovering a love for it as a student during a GOSH placement. I get to know the patients and families as they stay with us for a long time while we train the families or carers, and the patients’ houses are made suitable for discharge with appropriate care packages. Watching the young ones learn to take their first steps, then leave us walking, is such a nice feeling. Working at GOSH is special for me. I get such a buzz every morning I report for duty. Every night, as I leave, I smile to myself because I’ve done something good, even if it was just making a parent a cup of tea or listening to a child’s or family member's worries.